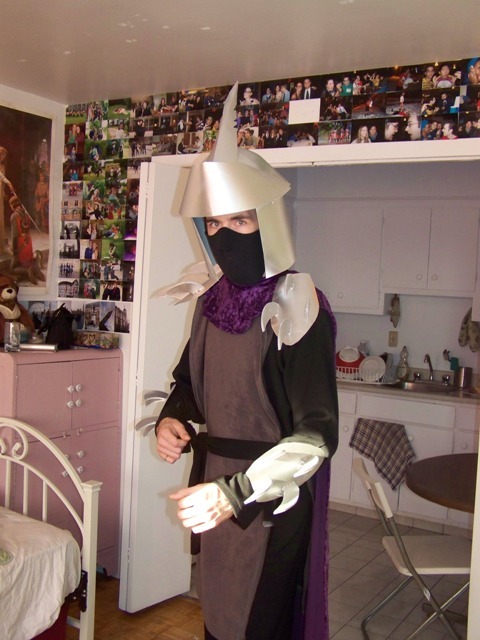 This was a joint effort between my boyfriend and I. I really wanted him to have a halloween costume and he decided to go as the Shredder. Thankfully he decided to go with the version that didn't have a full suit if armour! I was in charge of the actual clothing and he was in charge of the armour. I helped out a bit with the armour whenever he needed an extra hand at cutting out shapes. Tabard - I followed a very simple pattern I found on http://www.reddawn.net/costume/tabard.htm. We got dark grey suede as the material. The tabard came out a little thinner than I would have liked but it does the trick. Shirt - We used a black crepe fabric to make the shirt. I folded the material and laid it down on the floor. 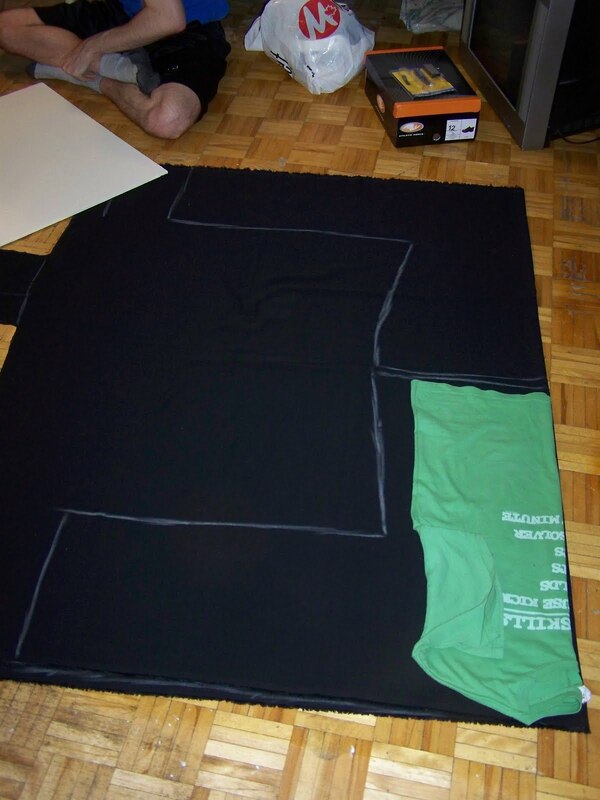 I drew out the pattern on the fabric by folding one of his T-shirts in half and laying it along the fold line. I used chalk to mark it up and basically eyeballed the design, giving lots of room for seam allowance and length in the arms and shirt. I had to do this twice to get the front and the back parts of the shirt. After cutting out the basic pattern, I chalked out the neckline and cut that out. I made my first seam along the top part of the sleeves and the shoulders. Next, I sewed along the edge that started on the bottom of the sleeve all the way to the bottom length of the shirt. There was considerable editing with the side seams and much cutting of excess fabric. I cut and hemmed the sleeves, the neckline and the bottom of the shirt. Pants - I used the same black crepe for the pants as I used for the shirt. I used the pattern provided on this site http://www.reddawn.net/costume/drawstri.htm with some alterations with the measurements to meet my boyfriends needs. Cape - The cape was completely hand drafted by me. I started out with a rough sketch of the cape which consisted of a rectangle topped off with a semi-circle. Along the line between the rectangle and the semi circle would be the neckline. Once I figured pout what I was doing I just chalked it out on the fabric, leaving lots of room for errors. I turned the rectangle into a trapezoid so that the bottom of the cloak would be wider than his shoulders and thus have more swoosh to it. I cut the semi circle and the trapezoid separately with appropriate necklines and then sewed them together. I made an interfacing for the neckline out of scrap material that that it would be sturdier. Armour - We started on the shoulder and wrist armour first to get the right shape and size. We drafted out a few shapes on poster board and cut them out. Then we sized them up against my boyfriend to see which was the better template. 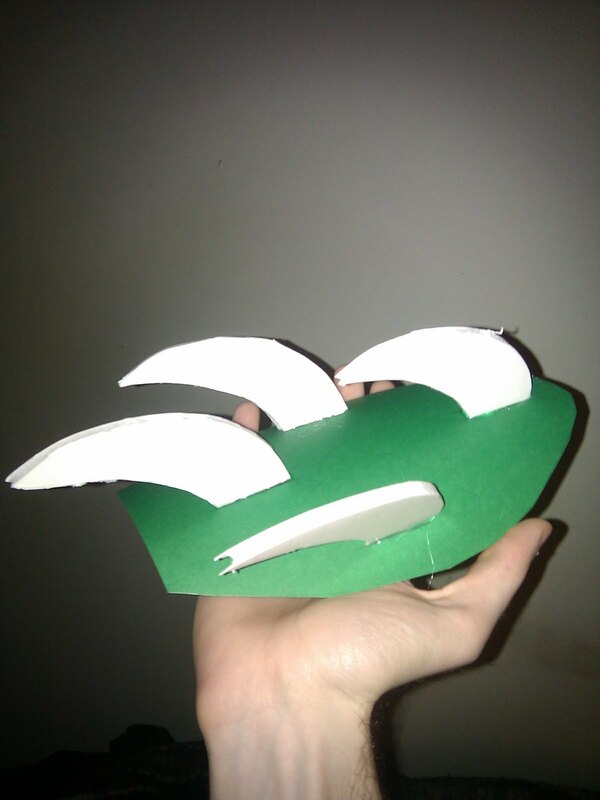 We used that template to then cut out two pieces of poster board for each armour piece (eight pieces in all). Before we put the pieces together, we had to decided how we were going to attach them to him. The shoulder pieces we decided were going to be pinned to his cloak and his wrist pieces were going to be tied to his wrist. Since each piece was going to be made of two layers, we cut slits in the bottom layer to allow pieces of scrap material through, short strips for the shoulders and longer strips for the wrists. Once the layers of fabric were in place, we glued the top and bottom pieces together and curved them. My boyfriend drafted the claws on foam board and cut them out using an exacto knife. We needed four pieces per armour piece so we had to cut out sixteen in total, along with some extras in case we screwed up somewhere. 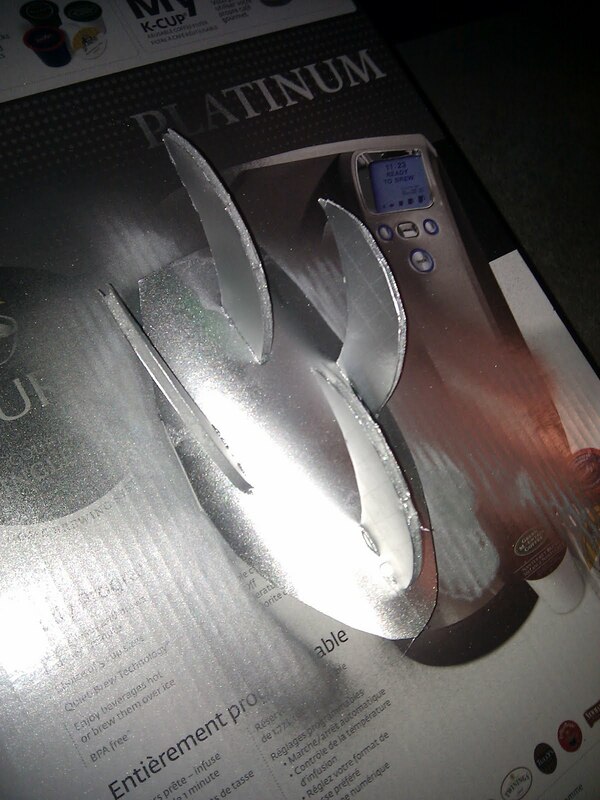 They were were hot glued to the armour in the desired direction. 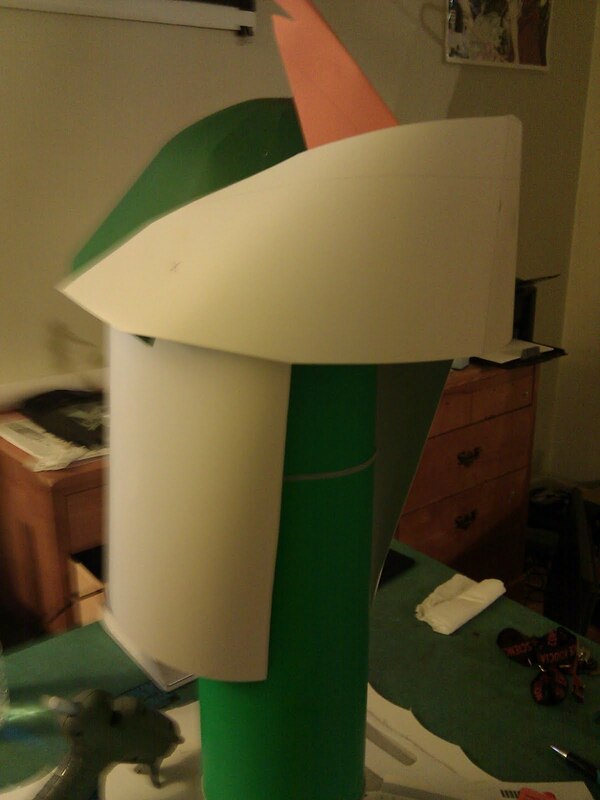 Before we painted them, we tried them on the costume to see if the attachments worked. Once everything was figured out, they were all spray painted silver by my boyfriend. My boyfriend did the helmet completely himself. He took a hard hat as a base and cut out small circular sections out of poster board. He attached them all around the hat for the top of the helmet to try and make it as round as possible. He them took an old coat hanger, unwound it and wrapped it around the base of the hat with one end sticking up. The wire would support the spike that protrudes from the front of the helmet, which was also made of poster board. He made the front lip of the helmet after the spike was attached. To finish it off he added the neck protection. He used the same silver paint on the helmet as he did for the armour.